The Chevy Silverado ad takes aim at the aluminum-body Ford F-150, betting consumers will pick steel for grizzly bear protection. The Chevrolet Silverado has gained ground on the segment-leading Ford F series. Here is share of full-size pickup U.S. sales. 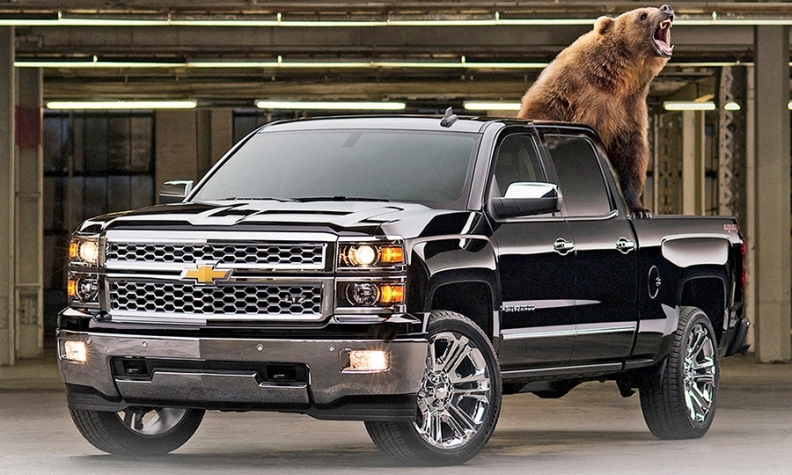 DETROIT -- The battle between the Ford F-150 and Chevrolet Silverado is headed for a cage match. Chevrolet is escalating the always-hot pickup wars this week with a social media campaign that takes a swipe at Ford's aluminum-body F-150. In a commercial slated for online and possible TV play, focus group members are asked which cage they would use for refuge when a grizzly bear lumbers into the room: one made of aluminum or another made of high-strength steel. Most scurry wide-eyed to the steel cage. For all the industry buzz leading up to the F-150 launch about Ford's big aluminum bet, Ford's marketing hasn't exactly flogged that point with consumers. Now, Chevy's tongue-in-cheek salvo brings the topic to the fore, raising the stakes -- and risks -- for both brands. “We’re proud to be America’s truck leader. Ford F-Series, including the all-new F-150, remains America’s best-selling truck for 38 straight years and America’s best-selling vehicle for 33 straight years," Ford said in an e-mailed statement. The strategy is risky for Chevy, too, says Jim Sanfilippo, an independent marketing consultant and former executive at ad agencies for Ford and Hyundai. For one thing, it could come off as hypocritical for GM, which uses some aluminum components, including the hood of the Silverado, and is sure to use more in coming years. GM is expected to make broader use of aluminum on the next-generation pickup -- possibly for the doors and liftgate -- when it arrives in late 2018 or early 2019, sources say. "If I'm a GM engineer working on the next truck, I'm scratching my head a little bit," Sanfilippo says. "They're probably telling the marketing people, 'Hey guys, you realize we're already lining up our aluminum suppliers, right?'" Sandor Piszar, director of marketing for Chevy trucks, says the video will be included in a social media campaign launching this week. Some content will include head-to-head comparisons of the Silverado and F-150. Other pieces, such as the grizzly bear spot, are "more whimsical and focus on customer perceptions of different materials that are used to build vehicles." "Our trucks are built with high-strength steel. We think that's a tactical advantage and an important differentiator," Piszar said. He added: "We have a pretty healthy sense of humor about it." Another spot, which features longtime NFL player and analyst Howie Long, compares potential repair costs between the trucks, noting possible costs of fixing an aluminum truck. Ford's statement in response, said: "The 2015 Ford F-150 is designed so sections of the truck are easier to repair in the event of an accident, significantly reducing time of repair and saving costs. Insurance rates are comparable with the previous F-150 and other full-size pickup trucks in the light-duty segment." Ford executives might not, judging by the last time Chevy took a high-profile dig at the F-150. During the 2012 Super Bowl, Chevy ran a TV commercial that showed Silverado drivers gathering during the apocalypse to mourn one of their buddies, who didn't survive in his F-150. Ford called on GM to yank the ad, citing insurance data that showed Ford trucks were safer. GM declined. Sanfilippo wonders about the timing of Chevy's latest shot at its archrival, which comes as the Silverado has been gaining market share on the F-150. "Chevy's got a lot of good things to talk about right now," he says. "I'd stick to talking about the merits of their own product and not look like they're running from something." Still, the approach appears to have support from one key Chevy constituency: its dealers. A few thousand of them were shown the video last month at a national meeting in Las Vegas. One dealer who attended said it was met with "resounding approval."